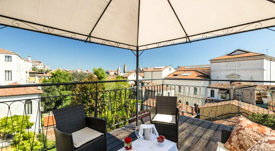 The Palazzo Guardi is an upscale bed-and-breakfast in Dorsoduro, within walking distance of the Alilaguna Blue Line airport-boat stop at Zattere (with no bridges to cross). The junior suites have canal views, and free Wi-Fi is available throughout the hotel. As you leave the Alilaguna Linea Blu boat pontoon, turn left and walk toward the first bridge. Do not cross the bridge. Instead, turn right onto the Fondamenta Nani, a street that runs alongside the San Trovaso Canal.. Walk along the canal, past the next bridge, to the Calle del Pistor. Turn right onto the Calle del Pistor, where you'll find the Palazzo Guardi's entrance just a few meters from the corner. Leave the cruise terminal by the main doors and walk straight ahead to the wooden bridge. Cross the bridge and continue walking on the Zattere, which is the pedestrian promenade alongside the Giudecca Canal. In a few minutes, you'll reach a bridge called the Ponte Lungo. Cross the bridge, immediately turn left, and walk straight ahead on the Fondamenta Nani (the street that runs alongside the San Trovaso Canal). When you reach the Calle del Pistor, turn right. The Palazzo Guardi's enrance is only a few meters from the corner.